Radio production never sounded so good! All Of The Best Radio-Ready Production Music Libraries In One Innovative Service. 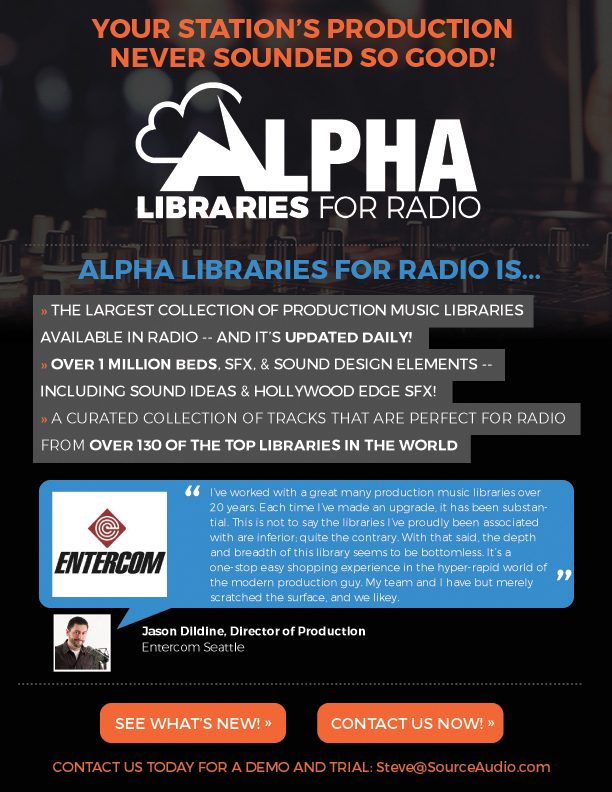 Alpha Libraries for Radio is the largest collection of music libraries ever distributed to radio. Watch this 2 minute YouTube demo. *Find the best music for your shows, commercials, and promos easier and faster than ever before. *Alpha Libraries for Radio is perfect for stations and markets of all sizes. *One simple Web solution with no software, drives, discs or updates for you to manage, ever. *Libraries and publishers manage and update their own content meaning you get new music instantly, every single day. *Access deep catalogs of brand new music from the top production music providers in the world. *Manage and collaborate on projects with playlists. Perform “sounds like” searches with mp3′s, YouTube and Sound Cloud links. *Lightning-fast downloads of mp3′s, wav’s, and aiff’s. *Music Beds, Music for Imaging, Production, Sound Effects, Sound Design Elements, Jingles & Clips. Contact Steve Wall 206-661-5551 or email Talent Farm to walk you through the key features, filters, mix outs, and quick search tips that will have you painting by ear with Alpha Libraries for Radio. Alpha Libraries for Radio has partnered with hundreds of music publishers, libraries and catalogs to bring you the deepest selection of music and sound design elements available anywhere on one perfect platform. Every genre, every format, everything you need! Click to sample Playlists of music genres. The artists and musicians signed with Alpha Libraries for Radio are creating what we hear in movies, television, and chart topping hits today. What people are saying about Alpha Libraries for Radio. Entercom Seattle KISW-FM The Rock, KKWF-FM The Wolf, KHPT-FM Hot 103.7, KNDD–FM The End. CMG (Cox Media Group) Miami WHQT-FM Hot 105, WEDR-FM 99 Jamz, WFLC-FM Hits 97.3, WFEZ–FM Easy 93.1. Alpha Media/Biloxi-Gulfport WXYK-FM 107.1 The Monkey, WQBB-FM Bob 105.9, WCPR-FM 97.9 Rocks, WGBL–FM 96.7 The Bull. Townsquare Media St Cloud WWJO-FM 98.1 New Country, KMXK-FM Mix 94.9, KZRV FM Rev 96.7, KLZZ 103.7 The Loon, WJON AM 1240 News-Talk-Sports, KXSS-AM The Fan. Here’s a quick start video to give you an instant tour around Alpha Libraries for Radio. LOS ANGELES, October 14, 2014 – Premiere Networks and SourceAudio, the largest professional, business-to-business music licensing and distribution platform in the world, announced today that Alpha Music Libraries now provides radio stations with access to more than 550,000 tracks and 7,200 albums to assist with production music needs. The increased offering is a result of more than 244,000 new tracks, including nine new libraries, being added to the digital music library since June of 2014. Among those libraries are: DBMP, Sonic Librarian, Black Toast Music, Transition Music Corporation, Transition Sound Effects, Style Trax, Figure & Groove, Sensory Overload and Sound Ideas. In addition, at least five new albums have been released each day during the same time period. 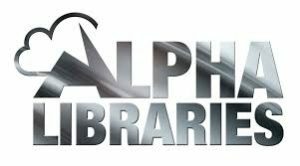 In January 2014, Premiere Networks and SourceAudio, partnered to provide exclusive domestic distribution for Alpha Music Libraries. 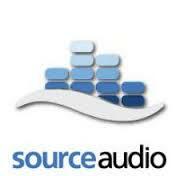 The comprehensive digital music library is assembled by SourceAudio in collaboration with Premiere. Utilizing a unique, radio-specific search and distribution system available on the SourceAudio platform, Alpha Music Libraries supplies radio stations with access to hundreds of production music libraries, many of which have never been marketed to North American radio before. Employing SourceAudio’s cloud-based search and delivery system, subscribing stations have access to the best new music for use in commercials, promos and spots – music that up until now has only been available to top advertising agencies, television production and major motion picture studios. A first of its kind, Alpha Music Libraries also features format-curated and customized playlist packages; high-quality, new music delivered continually from publishers; as well as file hosting for quick and easy collaboration, download, distribution and delivery. For more information, please visit www.alphalibraries.com and www.SourceAudio.com. For affiliations, please call Steve Wall at 206-661-5551.